Associazione Mendelssohn was founded in April 2009 by the pianist and Mendelssohn scholar Roberto Prosseda, in collaboration with Alessandra Ammara, Aldo Bernardini, Ingrid Sattel, Tina Messineo and Giovanni Scoz. 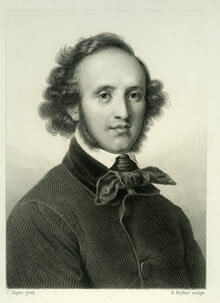 Associazione Mendelssohn aims to develop the research projects focussed on Felix Mendelssohn already undertaken by Roberto Prosseda and, at the same time, to produce new initiatives, also accepting proposals from members and from people and external institutions. For this purpose, Associazione Mendelssohn appointed a scientific committee, composed of Bruno Cagli, Hans Fazzari, Raoul Meloncelli, Charles Rosen, Peter Ward Jones and Peter Zappalà. The research work of the Associazione Mendelssohn will take place in the light of the constant exchange of experiences with the most authoritative Mendelssohn scholars and interprets. The honorary presidency of Riccardo Chailly is a further sign of the esteem and confidence that the Associazione Mendelssohn has already earned in the international music scene. Associazione Mendelssohn collaborates with Mendelssohn-Stiftung in Leipzig for several discographical and editorial projects. In its first six years of activity, the Associazione Mendelssohn produced 6 CDs, 4 video documentaries and 3 score publications dedicated to Mendelssohn's music. It also co-produced and supported several live events and special projects, including the iMendelssohn app.